This 100% natural Talalay latex pillow feels soft like you are sleeping on a cloud. It dynamically cradles your head and gives the sensation of floating. These latex pillows are covered with a washable organic cotton case with a zipper on the side for easy cover removal. 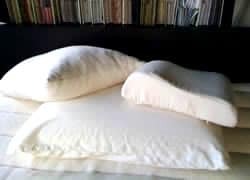 15" × 24"16" × 23"
The contour latex pillow is the natural alternative to the chemical memory foam contour pillow. These latex pillows provide proper orthopedic support to your neck. Cases are made from organic cotton and have a zipper to easily come off and be washed. Cases are sewn large so wash them before use and they will shrink to fit. You may adjust the firmness of this unique latex pillow. It can be made firmer by simply adding a small amount of stuffing through the zippered opening. Likewise, it can be made softer by removing some of the stuffing. These latex pillows are filled with brand new shredded certified 100% natural latex that is hand-stuffed into an organic cotton muslin case. The outer case is a heavy double knit certified organic cotton fabric. These pillows need the extra-heavy fabric so you can't feel the shredded pieces of natural latex inside. To make the outer case we first cut five yards of fabric and machine wash it on hot and tumble dry on hot to remove all the shrink from the fabric. The result is a much heavier outer material that won't shrink if you wash it. We make the Comfort Latex Pillow and all of these latex pillows in our factory. This latex pillow took some serious ingenuity to perfect. The problem came from the fabric we wanted to use. 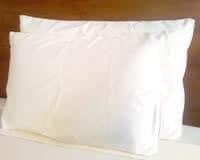 The latex pillow case shrank nearly 20% when it was washed. Since we wanted a washable pillow case we had to solve this problem. We began washing five yards of material at a time. We couldn't wash more or the material would just twist into a ball and wouldn't dry. We asked the mill if they could wash it for us. They tried but couldn't shrink the goods like a tumble dry on high could. Once the fabric is shrunk we sew it to size, taking time to over-lock (sew the inside) the inside fabric edges so it won't unravel when washed. We then shred new latex foam scraps with our man-eating foam shredder and gravity feed the shredded bits into an organic cotton muslin case. Finally, we insert that into our beautiful organic cotton double knit case. The finished latex pillow is then packed for shipping and sent by stork (UPS) to its new family. We posted and instructed "dry clean only." Customers still washed the case, and it shrank too much. We sewed the latex pillow case larger so that customers could wash it themselves. The strangest things would happen! The threads along the weft would shrink the fabric 10% just from sewing and the threads along the warp wouldn't. The case would almost shrink to size after being washed, but the zipper wouldn't shrink and the side with the zipper would cause that end of the pillow to snake up and down where the zipper didn't shrink but the fabric did. We tried fabrics that were thin that would sew fine and shrink fine... but you could feel every tiny piece of shredded latex inside just fine too! 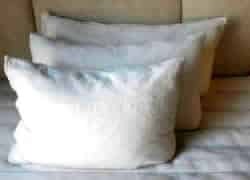 All pillows may be returned unused in new condition for a refund less a 15% restocking fee. Pillows are warranted to be free from defects for one year. Browse our clearance section for a discounted latex pillow that we have in stock. These are items we have priced to move. Unless otherwise specified, they carry the same warranty as any other pillow. In particular, because these items are offered at greatly reduced prices, a 25% restocking fee will apply to any return of a clearance item.